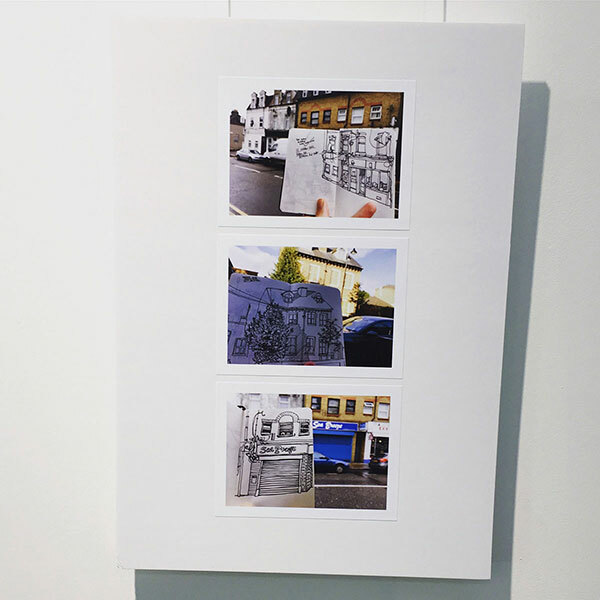 I recently exhibited at the Winns Gallery with 4 other artists for “Draw Walthamstow Draw”. 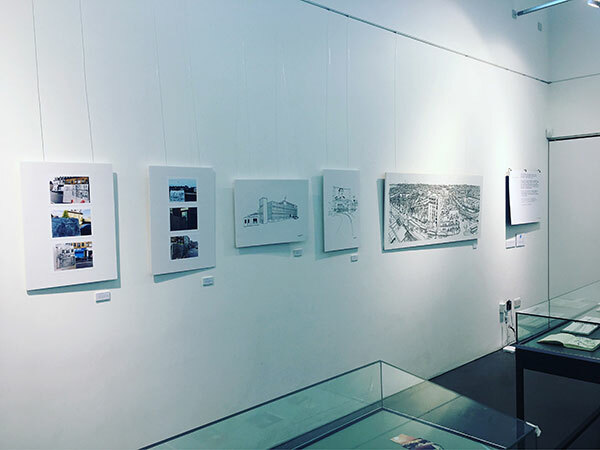 The exhibition was an open-invitation to the local community both to visit and collaborate, each visitor welcome to contribute to the exhibition. 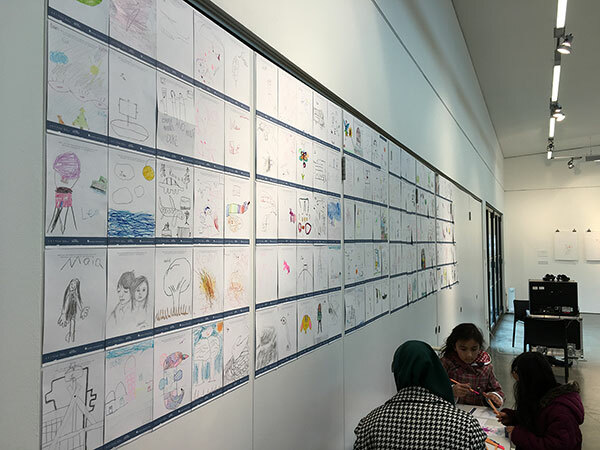 There was a great response over the week, the organisers stopped counting once it got to about 1500 visitors by the weekend and at the end of the exhibition a whole 5 metre wall had been filled with sketches, doodles and drawings from the visitors. 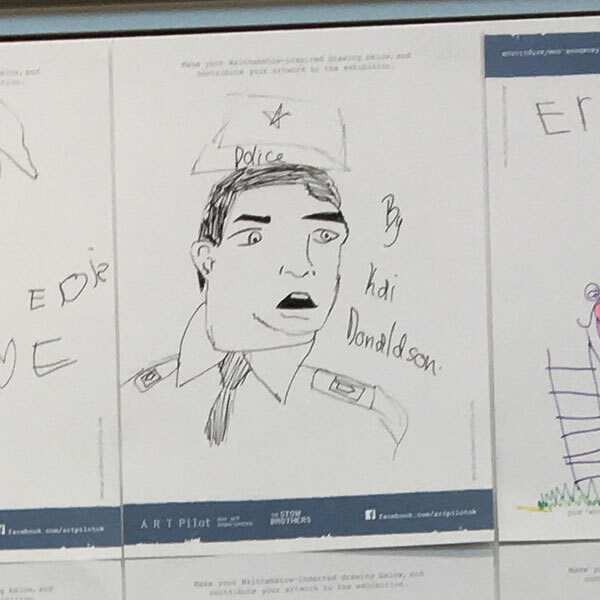 Here’s some information about the pieces I exhibited. 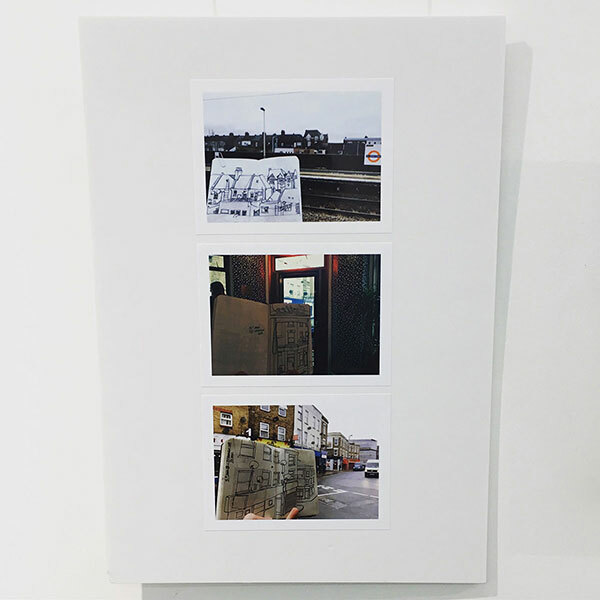 Most of my sketches out and about in Walthamstow were drawn in one pad, which made them a bit hard to exhibit. 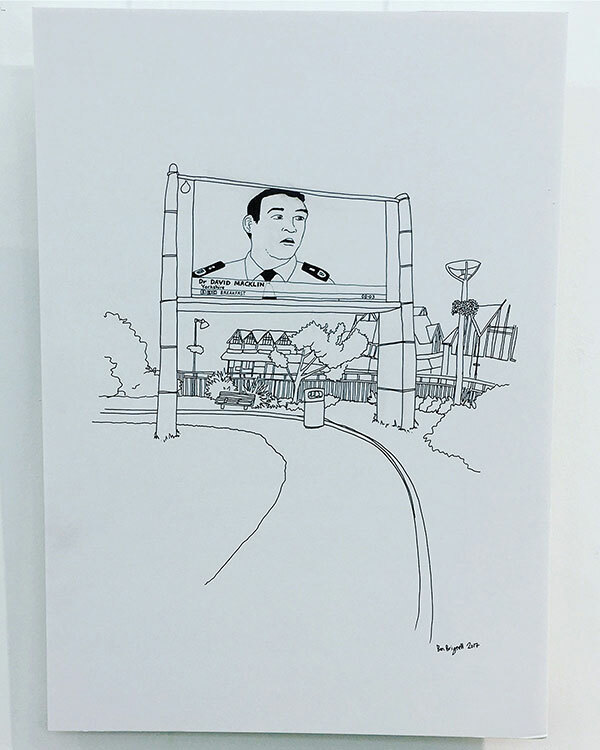 So I photographed and mounted some of these sketches with their real-life backgrounds. I simply love the Coppermill Water Works. I have tried for some time to get access to do a project on the entire site but haven’t been able to or had a response. I eventually managed to take a few decent-ish photos of the main building to base this sketch from—but I wanted to do a lot more, including some studies of the lookout tower looking over the entire plant. A few locals may remember the time during that heady December in 2015 when the huge screen in Walthamstow Town Centre froze at 08:02 one morning with Dr David Macklin stuck on BBC News. It remained frozen like this for almost three weeks. It was like he became some kind of overlord looking down on his subjects until the screen was eventually switched off. It’s frozen a couple of times since, one time with Carol Ann Duffy so I felt this event had to be commemorated. I hope it happens many many more times again. 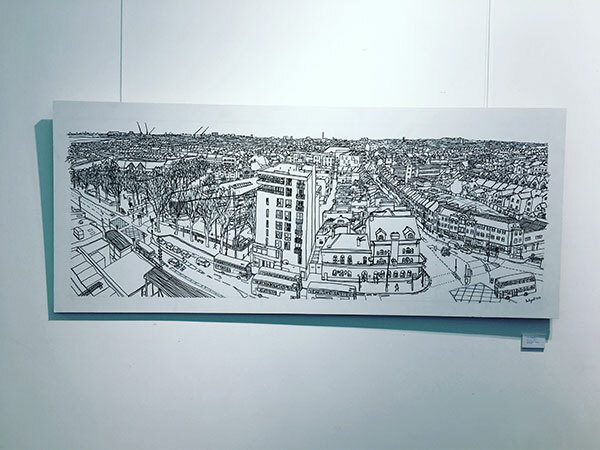 My main piece, which greeted visitors as they came in through the main doors, was a 5ft x 2ft drawing of the Walthamstow horizon, facing North from Walthamstow Central. A lot of people asked how long it took - I’m slightly annoyed with myself that I didn’t really keep track of how long I spent on it. It was probably a few hours here and there in the evenings and a couple of afternoons… ish? I worked from a few photos I took from the top of the Travelodge. Thanks again to the local staff, head office and brand department who went out of their way to help me get access and on a day where the weather was good enough to get some clear shots. Here’s a time-lapse of the whole illustration. 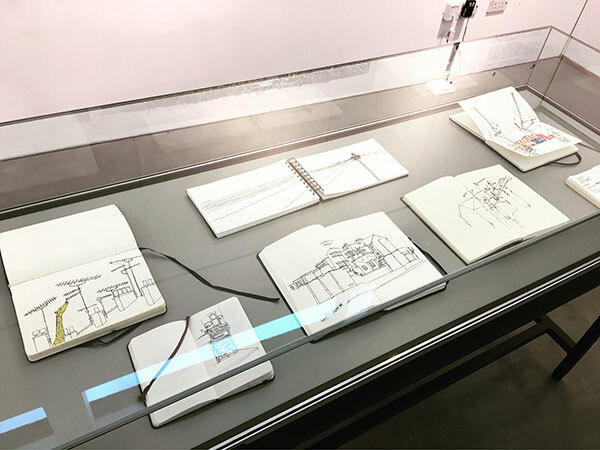 I always carry a sketchbook in my pocket and displayed a few books of the doodles and sketches I typically make of telegraph poles, satellite dishes and the spaces people make. 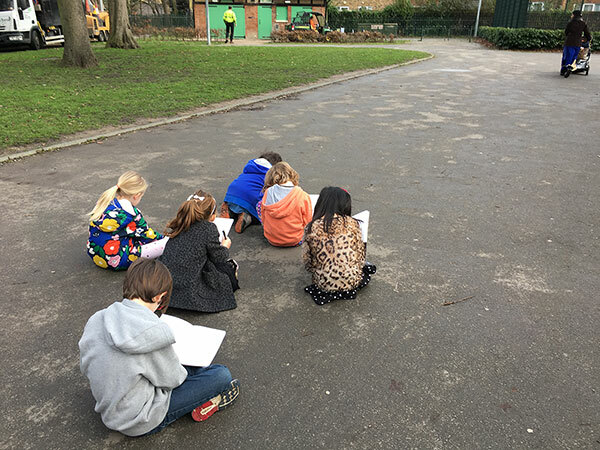 I ran two workshops on urban sketching where attendees took part in a few illustration exercises and techniques such as timed drawings and drawing a few different things around Lloyd Park of varying complexity without taking the pen off the paper. The feedback was great and there were a few small converted sketchbook carriers who left with a sketchbook in their pocket that they promised they would fill. Lastly here’s a quick 20 second tour of the exhibition. 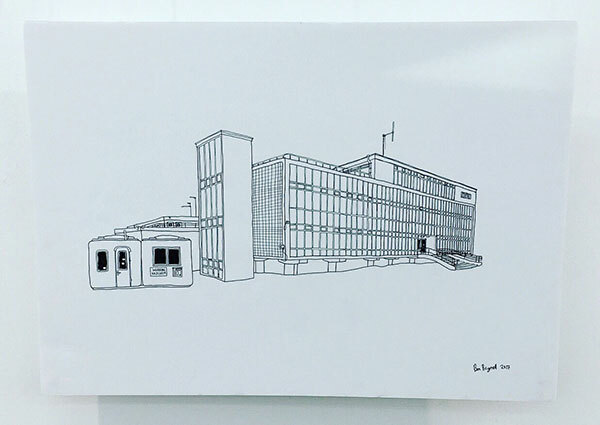 Winns Gallery Exhibition from Ben Brignell on Vimeo. Thanks to Emma and Ranjit and those involved with organising and setting up this exhibition.